I recently took a workshop led by Jessica Grace Kelley and Hannah Capin about writing for young adults. Both Jessica and Hannah have published young adult fiction and had a lot to offer to the class. First thing to realize is that Young Adult is not a genre, it’s a category. Makes sense. Young Adult is really an age-group, more specifically ages 13-18. Most all topics are on the table to address, so the genre could be fantasy, science fiction, contemporary fiction, mystery, romance, etc. The real key is the age of the protagonist. Teens don’t always want to read about adults as main characters; they need someone more relatable to their current life situation. Teens need to be the heroes of their own stories. Many times, parental-figures are few and far in between. That isn’t to say that the parents don’t play a huge part in shaping who the kids are; they just did their molding before the book gets started. Do you remember your first crush? Your first kiss? What about your first time driving a car? Sneaking out of the house? Teens are in the age of “firsts.” They are experiencing and sensationalizing everything for the first time. That’s why every event seems to take on more significance in this category. More drama, brighter colors, darker hatred, and deeper emotions. It’s also why even adults are drawn to read young adult books—to experience those feelings again. If you are interested in writing for young adults, start with action from the beginning to capture their attention. Remember, you are competing with Snapchat and Instagram. Draw them into the story and keep them there with tight writing (don’t overdo the scene setting) and emotionally-driven plots. Often, this category has a fake climax with a twist. Writing in first person helps the reader experience the action and passions with the protagonist. They become more invested in the characters and develop solid connections. They’ll find themselves rooting for certain characters and despising others. That’s when you know your writing has reached them. At this age, teens are trying to figure out their place in the world. That starts with their place in their school and social group. Are they a jock or college-prep? Where do they fit? How do they feel about fitting in…or not? Think of stories like Divergent, Hunger Games, and Harry Potter. The social strata play a major part in how the kids interact and react to the action. But that can’t be the end of it. This generation is all about breaking down the social structure and setting new rules. Make sure your plot addresses the lines that have been drawn and does something with them. Change? Dissolve? Buildup? That’s up to you, but don’t leave them hanging. In most good books, there needs to be character development. It’s even more important in teen characters. During high school, students are exploring what they want to grow into, how they want to be perceived. They make mistakes, and they overcome. In popular young adult books, they do this on their own with very little help from adults. They are the heroes, after all. As you are writing your story, take the time to give your character some depth. What drives them to do things? What is their family life like? A rich, only child will probably react differently to a situation than a less affluent teen with seven siblings. Maybe in some things, they react the same way; that is also telling. Even if you don’t use the information directly in your manuscript, you should know your characters’ strengths and weaknesses. If you aren’t consistent with how you portray them, the reader will know, and they will come across as flat or unbelievable. While all this information is great to consider, keep in mind that it was two female authors. I would like to hear how books written for the male audience may differ? I need to hear from a male writer, or better yet, READER! Do you agree with everything said above? Or are you looking for something different? If you get a chance to hear either of these ladies speak, I would highly encourage it. 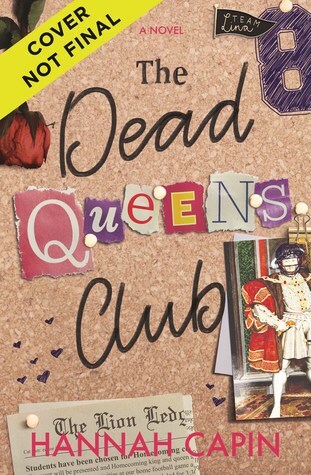 Hannah’s book, The Dead Queens Club, will be released January 2019. Dawn is an author of nine books and writes for the Next Door Neighbor magazine. Her passion for reading and writing started young. It wasn't until retirement from the Air Force after 28 years, that she was able to focus her attention on her true calling. She loves writing, teaching, coaching, and working with the Girl Scouts.